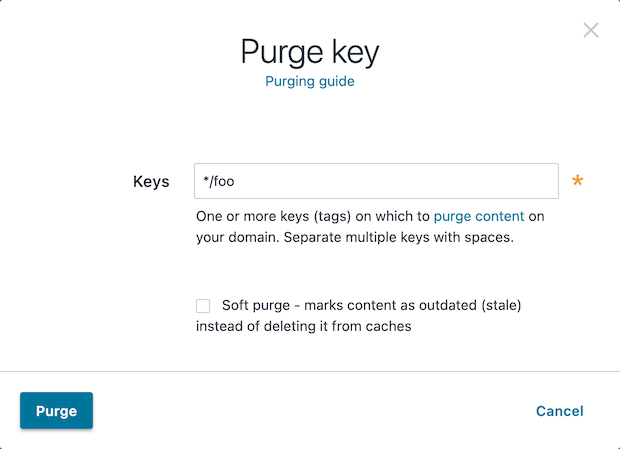 Wildcard purging allows you to flush the cache of all pages under a directory branch or URL path; for example, you want to empty the cache of all pages under your "/service" path. Having to purge each URL one by one using the Fastly API or via the Fastly app is not very efficient. Although Fastly does not have a specific wildcard purge function, you can implement the same behavior by making a small configuration change using surrogate keys. Surrogate keys allow you to tag a group of objects with a keyword (key) and then purge multiple pieces of content at once with it via the web interface or via custom VCL. IMPORTANT: Purging will only apply to new objects as they're being put into the cache after you set up configuration changes. It will not apply to objects already in the cache when this configuration is being applied. To purge content based on wildcard paths, follow the steps below. To purge content based on wildcard paths via the web interface, follow the steps below. We set a default wildcard so that we have the flexibility to append other surrogate keys to a URL path. In the Name field, type Default Wildcard. This name is displayed in the Fastly web interface. From the Type menu, select Cache and from the Action menu, select Set. In the Destination field, type http.Surrogate-Key. In the Source field, type "". Click the Create button. A new header appears in the Headers area of the Content page. 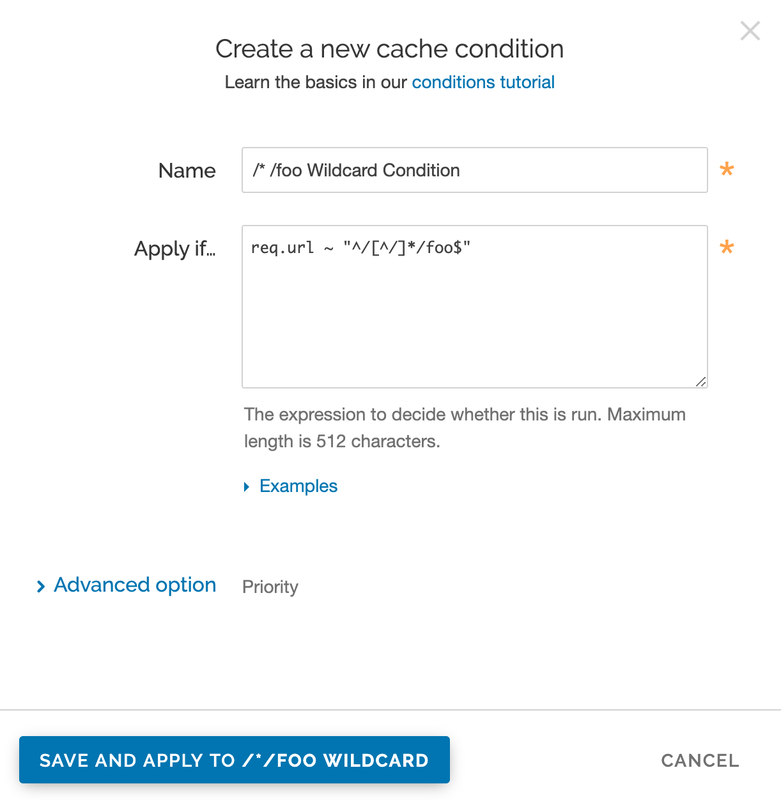 Next, create a header for each of the wildcard paths you need the ability to purge. For instance, you want to purge the wildcard path /*/foo. Click the Create header button to create another new header. In the Description field, type /*/foo Wildcard. This name is displayed in the Fastly web interface. From the Type menu, select Cache, and from the Action menu, select Append. In the Source field, type " */foo". There is a space before the asterisk in the Source field, which is important when appending multiple surrogate keys to a URL. Notice the Action is set to Append to add to the default wildcard surrogate key. 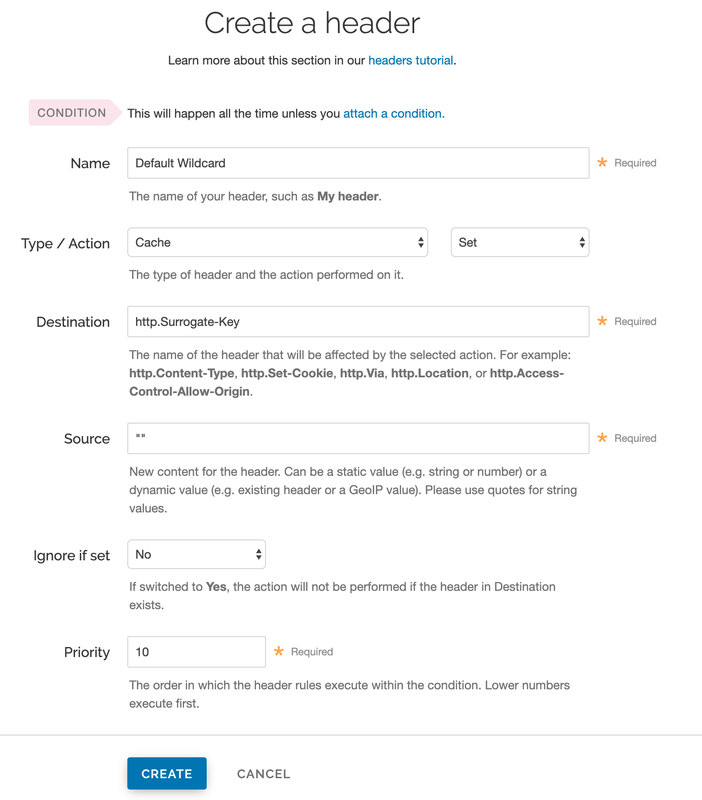 The Priority is set to 20 so that the Default Wildcard header is executed first and then the wildcard path appends. Finally, create a condition for each of the wildcard paths you need the ability to purge. Click the Attach a condition link next to the wildcard path header name. The Create a new cache condition window appears. In the Name field, type /*/foo Wildcard Condition. In the Apply if field, type req.url ~ "^/[^/]*/foo$". 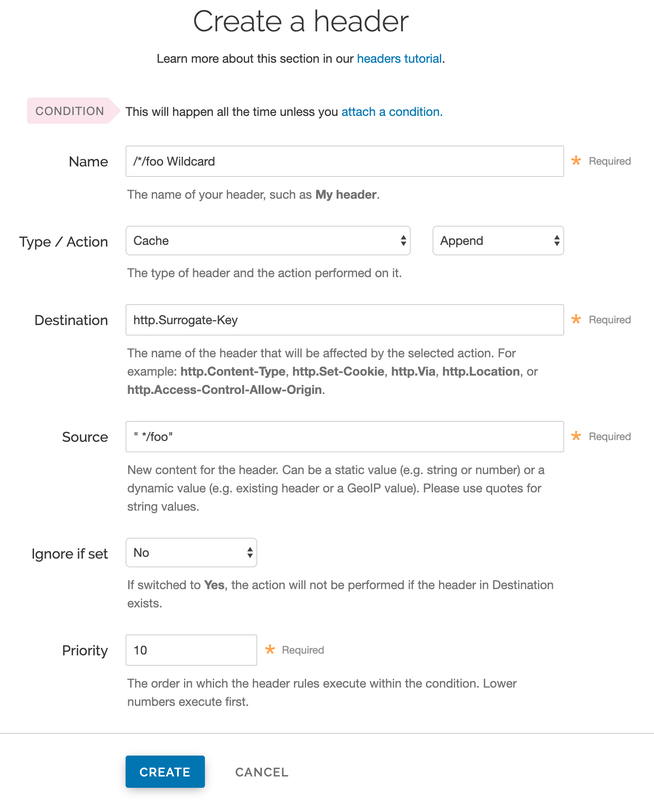 Start from the first slash after the request host header. There should be one directory. It should be followed by the path /foo ending the URL. Some examples would be /a/foo, /bar/foo, and /c/foo. You could also remove the first "^" and ">"$" to allow the condition to be more general so that the pattern can occur in the middle of a URL path. Ready to purge that wildcard? You can do this through the UI using the steps below. From the Purge menu, select Purge Key. The Purge Key window appears. In the Keys field, type the surrogate key you want to purge. Continuing with our example, you would type */foo without the quotes that were entered in the Source field of the New Header window above. To purge content based on wildcard paths via custom VCL, follow the steps below. In the above example, the < Surrogate-Key: /test /test/test2 /test/test2/file3.txt headers show the addition of the three surrogate keys. This will purge any content that was associated with the "*/foo" surrogate key according to the setup in your header rules. Additional syntax for purging a service through the API can be found in the Purging section of the API documentation.